It was a sheer fluke that on the final day of my Tuscan holiday, I ended up watching the first episode of the new Netflix show Salt Fat Acid Heat. 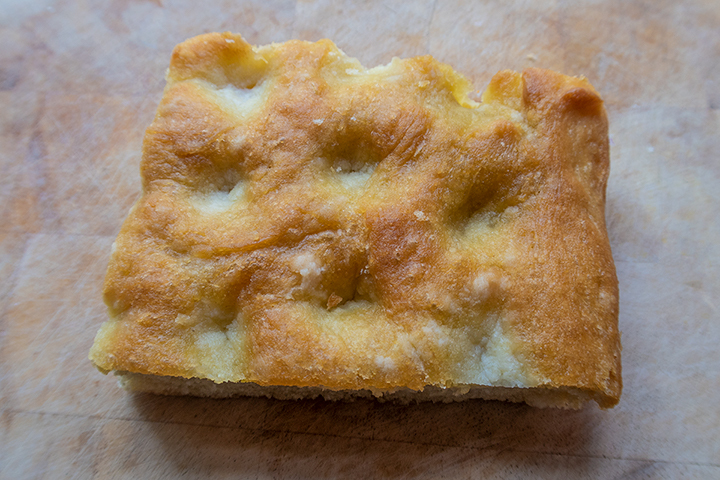 Taking the theme of ‘fat’ and focusing on olive oil, that first episode is set in Italy and, for me, the moment where my hair stood on end was watching the making of focaccia. The rubbing of olive oil over the surface, and the joy taken in it, was truly life affirming. 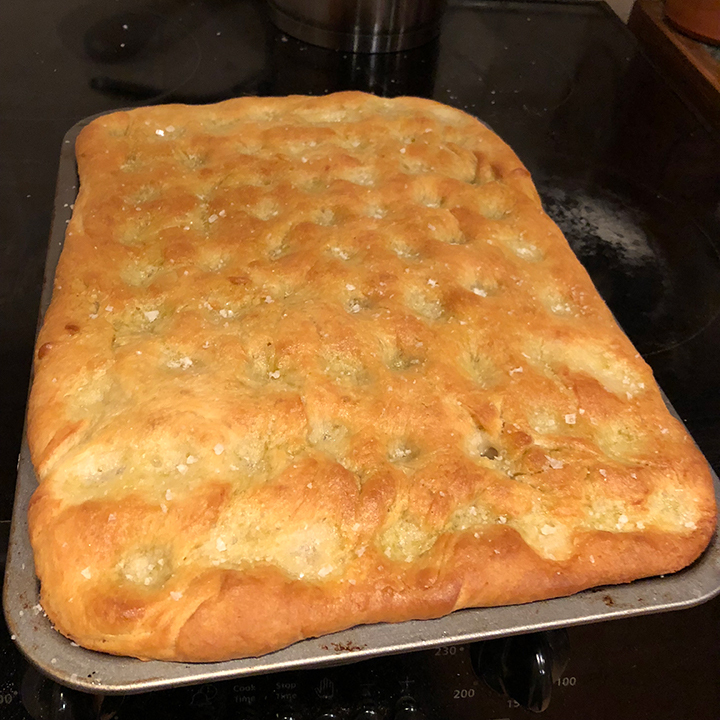 So, needless to say, once I got home I had to make my first ever focaccia. Mostly, I adapted (once again) the recipe by Emiko Davies from her ‘Florentine’ book. Except that I’d seen elsewhere that many people use a combination of flours - plain flour and tip 00, also known as pasta flour. So I gave that a go. 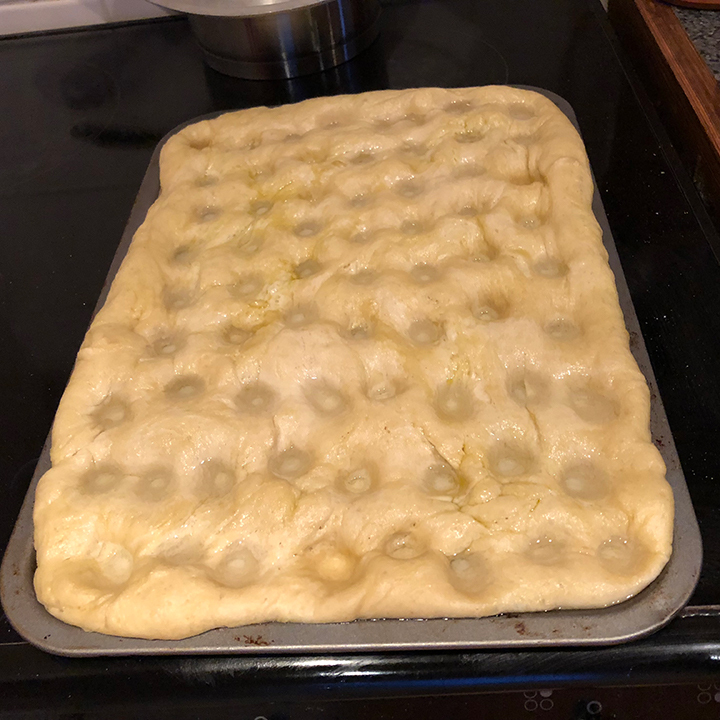 And, of course, I wanted to do the finishing that I’d seen on Netflix, which not only included the oil, but also splashing salted water into the dimples before baking to help keep them in the final loaf, and to give a little extra salty tang to the crust. Doubtless I have mangled together different regional traditions in so doing, but such is life. I’m not sure I was expecting it to work so well - my total conviction was that, in the oven, the bread would rise aggressively, casting into oblivion the dimples and any notion that this bread should be broadly flat. But that didn’t happen. It worked brilliantly. I happily chopped it up, devoured two portions there and then, and put the rest in the freezer for subsequent snacking. And now I can’t imagine it not becoming a staple that I make every month. Add the sachet of yeast to the warm water, along with a tablespoon of flour and leave until bubbling. Then combine the flour, water, milk, heat and 1 teaspoon of the salt in a bowl. Add 60ml of the olive oil and the butter. Knead on a lightly floured surface to make a dough, and keep kneading until soft and elastic and no longer sticky. Place the dough in a bowl, cover with a cloth and leave to rise in a warm place. Once it has doubled in bulk, punch it down. Roll and stretch the dough into a rectangle about a couple of centimetres thick. 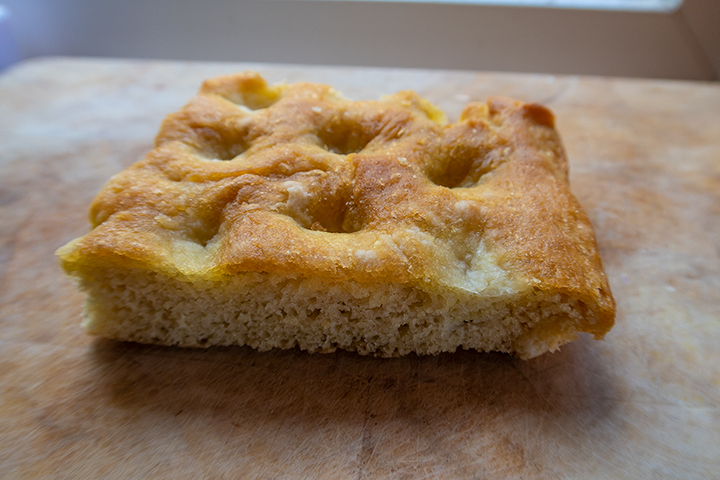 Line a baking tray with baking paper, and put the focaccia on top. Pour the rest of the olive oil generously over the top and rub it in with your hands until evenly coated. Leave again for a second rising for about an hour. When it’s risen enough to become mostly smooth, preheat the oven to 200ºC / 180ºC fan oven. Then, using your fingers, make deep dimples in the dough. Sprinkle with water with a couple of teaspoons of salt added, so that the water sits in the dimples. Add a tiny scattering of crunchy sea salt in addition, and then bake the focaccia for about 20 minutes, or until golden brown. Not really an issue with this recipe. Rejoice!